The Bible says a time will come when a global dictator requires everyone on earth to receive a mark on the right hand or the forehead (Revelation 13:16). Those without the mark won't be able to buy or sell anything (Revelation 13:17). For centuries, Christians have wondered how this will even be possible. But in recent years, the rise of advanced technology has given us a glimpse as to how it might occur. New technologies have driven endless speculation about what the mark will be. Some think it will be an implantable microchip. Others think it will be a visible tattoo. Still others think it will involve bar codes or RFID chips. And on and on. The fact is, we don't know. And we won't know until the mark actually appears. However, we can know this - the technology is here to make such a mark possible. To control every buy and sell transaction in the world, the Antichrist will need to set up a system capable of tracking every transaction. And thanks to modern technology, we can easily envision such a system. Much of the foundation for one is in place. Electronic payments are already a way of life, and they foreshadow the coming of a cashless society. 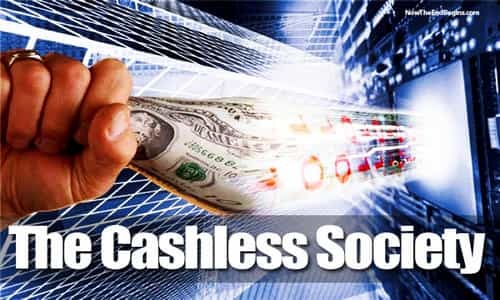 In fact, not only is a cashless society possible - it's inevitable. For years, people have speculated as to how the Antichrist will exercise the immense power of Revelation 13:17. How will he control every buy and sell transaction? Many transactions, such as the buying and selling of illicit drugs, are already illegal. Yet despite this, black markets for these products thrive. People regularly buy and sell drugs and other illegal products "under the radar," where the government rarely sees, much less has the power to control, what's bought and sold. Cash is critical to these black markets. Almost everyone accepts cash as a form of payment, and it's hard to track where cash goes and what it's used for. But the ability to use cash to hide your activities, or simply remain anonymous, is coming to an end. Why? Because cash (currency and coins) will soon disappear. Don't doubt it. It's going to happen. And it has nothing to do with a government desire to get rid of cash. It's a foregone conclusion because cash will soon be worthless. In a world of new technologies where every molecule can be perfectly positioned, it won't be possible to stop counterfeiters. They'll be able to create exact replicas of every national currency. And when that happens, the world will be flooded with fake money - worthless fake money. And since no one will be able to tell the difference between the fake cash and the real cash, both will be worthless. In such a world, the only way to prevent counterfeiting will be some form of electronic tracking of cash. An electronic means to verify the authenticity of a cash note. But if you're using electronic tracking devices within cash, why bother to make physical currency at all? Why not just make all transactions electronic? Essentially, that's what we're seeing now. The majority of buy and sell transactions are electronic. Think about your daily routine. Whether it's the coffee shop, the grocery store, or Walmart, how do the people around you pay for what they're buying? If you take the time to look, I bet you'll see a lot of credit and debit cards - maybe even a mobile phone payment. According to a 2016 Gallup survey, only 24% of Americans make all or most of their payments with cash. And the younger you are, the less likely you are to use any cash. In the United States, cash is becoming obsolete. Nevertheless, according to MasterCard Advisors, 85% of global payments are still made with cash. How will the Antichrist be able to control those transactions? He'll be able to control them, because the situation will quickly change. Take India for example. In late 2016, the Indian government announced a crackdown on tax evasion, black market goods, and counterfeiting. All existing 500 and 1,000 rupee notes would soon become worthless. Citizens needed to exchange them within a short timeframe for new 500 and 2,000 rupee notes. The result? No one wanted to accept the old notes as payment, so electronic transactions skyrocketed. According to The Wall Street Journal, mobile wallet payments jumped 104% in India between October 2016 and February 2017. But while electronic payments are more efficient and convenient, they also create a problem. You can't hide them from the government. While this is good in some ways (catching criminals), it's terrible in others (government invasion of privacy). Without proper safeguards, governments will have the unprecedented power to monitor every buy and sell transaction you make. This is nothing new. For those of us who already use electronic payments for nearly everything, this is already the case. But in the future cashless society, you won't have a choice. So why does any of this matter? Because of this... At some point in the near future, the Antichrist will seize power. When he does, a global electronic payment system will already exist. While it remains to be seen how he will control every buy and sell transaction, the stage is being set. Convenience has already led to most transactions going electronic. And soon, new technologies will make all paper currency obsolete. This will eventually create a situation where a global government could monitor and control every economic transaction on earth. Such a system has never existed in the nearly 2,000 years since the Book of Revelation said the Antichrist would control all buy and sell transactions (Revelation 13:17). In fact, such a system was impossible for all of those nearly 2,000 years. But today? Today is different. We see the groundwork for such a system coming into place. It's yet another sign of the soon return of Jesus Christ.